Soccer apparel is a fashion that I notice most during the spring and summer seasons. 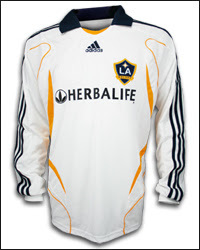 I have been known to purchase the Mexico-zip up jackets or Brazil warm ups, everyone loves the red, green and yellow color combinations, but this year I may lean more toward soccers most sought after wonder-hunk David Beckham and his LA Galaxy team apparel. The Becks recently held a press conference in Korea with another "obviously" handsome soccer player by the name of Lee Eul-Yong who plays for Seoul FC. These two exchanged jerseys for the picture below and looked great doing it. I have included a link of where David Beckham's Adidas branded white with blue and gold accents "home" jersey can be purchased for a price of $67.50.